Supporting all your worthy causes has never been so easy. 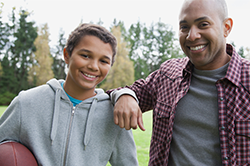 The Mercy Home for Boys & Girls Donor Advised Fund (MHBG Donor Advised Fund) gives you unparalleled flexibility—from what you donate, to when you donate—our team of experts will help you revolutionize your giving plan. With the MHBG Donor Advised Fund, you make charitable contributions when it’s most convenient for you, manage those assets and make donations (known as grants) to qualified charities when you feel moved, rather than by December 31. Best of all, your recordkeeping is simplified with just one tax substantiation letter regardless of how many charities you support. Through Mercy Home, you set up an account within the MHBG Donor Advised Fund, name it (i.e. The Jones Family Foundation), and contribute cash, securities or other assets to get your fund started. Your contribution is an irrevocable gift and is eligible for charitable income tax deduction. Once you contribute cash or assets into your donor advised fund, you have the option to invest those assets, which may increase your impact on the charities most important to you. The MHBG Donor Advised Fund currently uses five separate investment pools, which are professionally managed by Morgan Stanley, and which represent different investment strategies. Distributions (called grants) can be made from your donor advised fund to Mercy Home or any other qualified charity today, tomorrow, or anytime in the future—even generations from now. You make grant recommendations through your online account with the push of a button, or by contacting Mercy Home directly. This allows you consolidate your giving and manage deduction with a single charitable receipt. Already have a Donor Advised Fund? If you currently have a donor advised fund with Fidelity Charitable, Schwab Charitable, BNY Mellon Charitable Gift Fund, or Greater Kansas City Community Foundation, you can help our children today by using the DAF Direct Tool on the right. Simply scroll down to your provider, recommend that a contribution be made to Mercy Home for Boys & Girls, and fill in your personal information. The gift will automatically be debited from your donor advised fund. If your donor advised fund isn’t listed here, or if you would prefer to send a gift by check, simply reach out to your DAF administrator and recommend that a contribution be made to Mercy Home for Boys & Girls. Once you make the recommendation to your DAF advisor, a check will be sent directly to Mercy Home from your fund. Giving should be approached with the same level of discipline and diversification as any investment plan. Mercy Home’s Philanthropic Advisory Team will act as your partner in helping you identify your giving goals and develop an achievable and affordable program for giving. Our team is there to help you research areas of charitable interest or specific charities, as well as discuss ways to include your children and grandchildren in your in following your giving legacy. We will guide you through the process of deciding how your contributions should be invested to help ensure you meet all of your goals, taking time to help you consider your giving and investment goals, risk tolerance and time horizon. It is easy to give away money. The greater challenge is to give it away effectively, so that your giving makes an even greater difference. Let us help you maximize your impact and simplify your giving by calling us at 800-378-8266 or emailing us at [email protected]. No question is ever too small or unimportant.